This updated design makes T-shirt shopping a breeze for your customers! This four sided rotating T-Shirt display is made with a scuff resistant laminated wood and includes casters. The Revolving display can hold up to 20 different styles of t shirts, calendars or books. 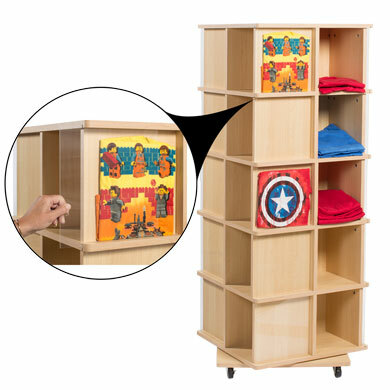 The Revolving Cube Display features a unique acrylic front pocket to display T Shirts or products next to the folded product. To display product, simply slide the acrylic front and add items, its that easy. Each cube measures at 9 1/8 in. L x 11 1/2 in. D x 11 in H.
Available in Black, Cherry or Maple. Assembly is simple and takes approximately 3 hours or we can assemble for you for an additional $75.00 per unit. Add item #1133 to cart get have this unit ship assembled. 23 1/2 in. W x 23 1/2 in. D x 63 in. H.